Former head of Mr Amama Mbabazi’s security detail Christopher Aine has returned from the ‘dead’ months after he disappeared. Standing meekly and looking apologetic, Mr Aine said in an exclusive interview with Daily Monitor’s sister TV Station NTV that he was hiding in Dar es Salaam, Tanzania and chose to disappear because he wanted to stay out of danger that lurked over him just after the Ntungamo clashes. Apologising to those he hurt by his disappearance, including Mr Mbabazi, Mr Aine said he wants to start his life afresh and feels he can no longer handle working in security. “If I happen to meet anyone who wants to help me, I would tell them that I want to be free. I want to live my life as a free man going around with my business because I think I can no longer handle security work,” he said. He added that he is open to working with Mr Mbabazi in case he has any work for him. “He is mature person. We are the young ones. If he wants to me to do anything for him, I will do it. He, at least, has never told me that he no longer wants my services,” he said. He gained a bit of weight and had an uncharacteristic mound of hair on his head in his debut appearance. He spoke in a relaxed manner and hardly looked into the camera. 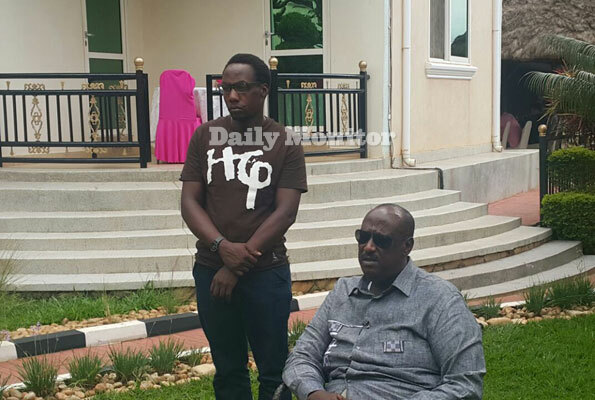 He said he always wanted to return and tried to reach Police Chief kale Kayihura and failed. “I thought about two people. My boss (Mbabazi) and Gen Kayihura thinking they would talk to people in government so that I come out but all it was not easy reaching out to them because I had left all my phones in m y house(in Kyanja),” he said. Gen Saleh said he will keep Aine at his home and will lead negotiations with government to ensure that Aine regains total freedom. “It’s good he is alive. It is good for his family and our family. He came to me because I am his father. We will do whatever it takes to ensure his life returns to normal,” he said. However, it is not yet clear how Mr Aine, who had a Shs20m bounty on his whereabouts, could have entered and then live in neighbouring Tanzania without being noticed. Mr Aine disappeared two days after the now infamous Ntungamo clashes where supporters allied to then candidate Yoweri Museveni clashed with Mr Mbabazi’s security team.